Carousel Coral: Favorite Summer Peachy Blushes. Peachy blushes have always been an addiction of mine, because that color is the one that suit me the most, on my cheeks and on my lips. In this post I include some of my HG for many years now, unfortunately I had more but they are finished long time now. Mac-wise my skintone is NC25, sometimes NC20 depends on the foundation, but since the rest of my body is lighter, keep in mind that the swatches I took are on a NC20 skintone. Let's start with my an old favorite of mine, Nars Gina, which is also my only Nars blush. Unfortunately I had to depot it because something weird happened to the packaging, the rubber just melt off and it was disgusting, so I put it in a Shu Uemura empty palette I had for years. Gina is a matte true orangey peachy shade with no red or pink in, and it's super pigmented, I always have to be careful when I apply it. I used to have Mac Peaches, and it's a good dupe of Gina. I don't recommend it for skintones lighter than NC20, also it works best with warm skintones. Next is Shu Uemura's Glow On P Peach 47. I'm not so sure if Shu Uemura still makes this blush, but I know for sure that the packaging of their blushes have changed, I have this blush for many years, it was a gift from an old internet friend. This is a true orangey peach blush, in the same shade category with Nars Gina, also matte, but it's not as pigmented or as bright as Gina. And it's also a tone lighter. This shade of peach is the perfect one for fair skintones, because of its satin texture is very buildable you can go from a super light result to a bright one. Here's more of a peachy coral pink option, this is from an old Stila summer collection back in 2007 and it's a duo blush called Quaint & Coral Cheek Duo. Unfortunately it was limited edition but I'm pretty sure you can find something similar, most companies make peachy pink blushes. Quaint is the lighter one at the left and Coral is the brighter one at the right. But the swatches I took on my fingers the lower one is the Coral and the upper one is the Quaint. Both shades are shimmery, Quaint is more shimmery and since it's lighter, on my skin it appears more of a warm pink highlighter. Coral is a very pigmented peachy pink shade. I like to use Coral as a blush and Quaint as a highlighter but sometimes I mix them together. 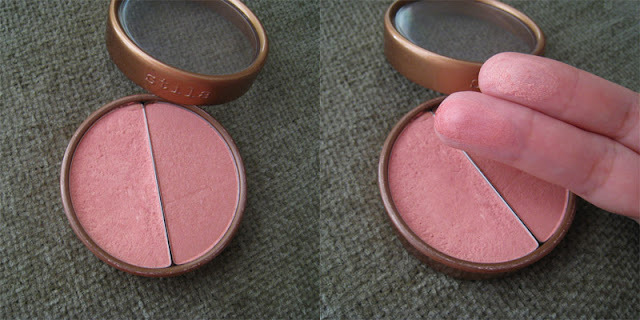 From Mac I have 3 peachy blushes that I love, if still had Peaches I would show you that one too. 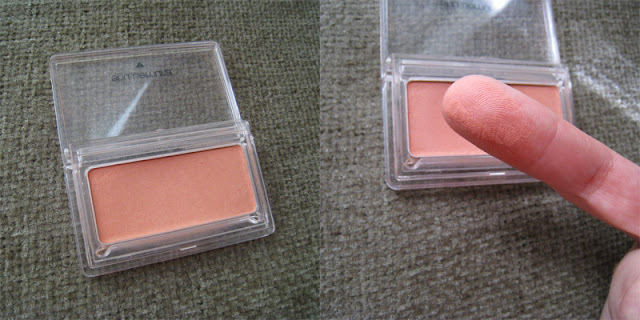 First is a Mineralize blush, it's called Nuance. 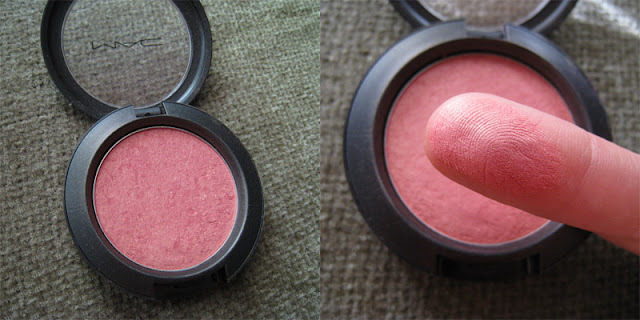 It's one of the first Mineralize blushes Mac released back in the summer of 2008 with the Sonic Chic collection. And I have to say that, this bunch of Mineralize blushes had the best texture that Mac ever had in their mineralize range. So smooth and not glittery at all. Nuance is an orangey-bronze shade of peach. Because it has golden shimmers it gives a nice sheen on my cheeks and I don't need to use a seperate highlighter with it. It looks amazing on tanned skin, but if you have a lighter skintone,you can combine it with bronzer it will make you look like you had a tropical tan. I wish Mac will re-release it someday. 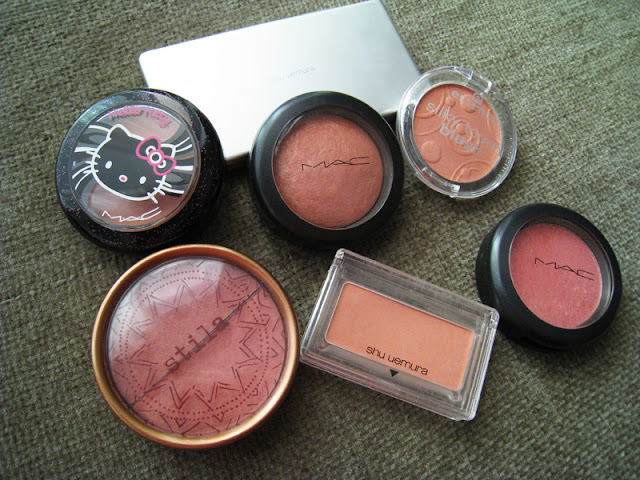 Next is also a limited edition blush from Mac, from the Hello Kitty collection back in 2009. 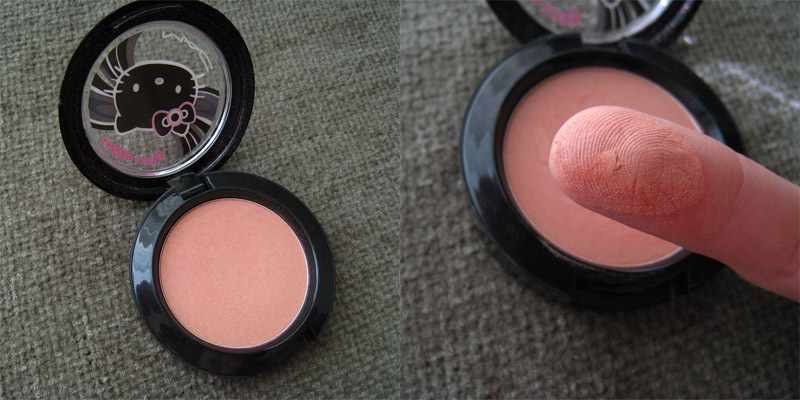 It's called Fun & Games and actually is a Beauty Powder blush. It's not one of my HG blushes because it's very sheer, but it's a great blush for lighter skintones, especially for NC15's. The shade is so pretty, for me it's a true peaches n' cream shade. The finger swatch I took is the true shade after I really packed it on. But if you use a dense brush, like the Sephora I.T. Natural Foundation brush ( that's what I use) you will be able to make it look pigmented on cheeks. Also Mac's 109 brush is a good option. Lastly from Mac, is Springsheen, which was included in my May favorites. It's a very pretty peachy pink shade, more pink than peach though, and it's a great option for those who are afraid of peachy shades but they want to try something else besides pink. It's a Sheertone Shimmer blush, that means it contains shimmers, it leaves a nice golden sheen and you don't have to use a seperate highlighter. 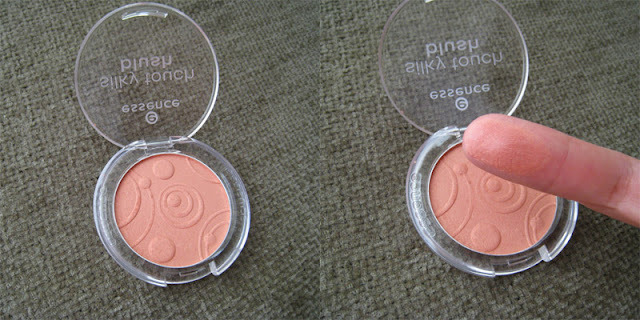 And lastly for a more cheaper option, the Essence Silky Touch blush in Secret It-Girl . It's a very pretty true matte peachy blush, even though I can see some shimmers in, on my cheeks they're not visible at all. I think it's a really good dupe of Shu Uemura's P Peach 47. And it's also quite pigmented for such a cheap blush. I can't reccomend it enough, especially for those who have never tried a peachy shade and they just want to experiment with a cheaper option. 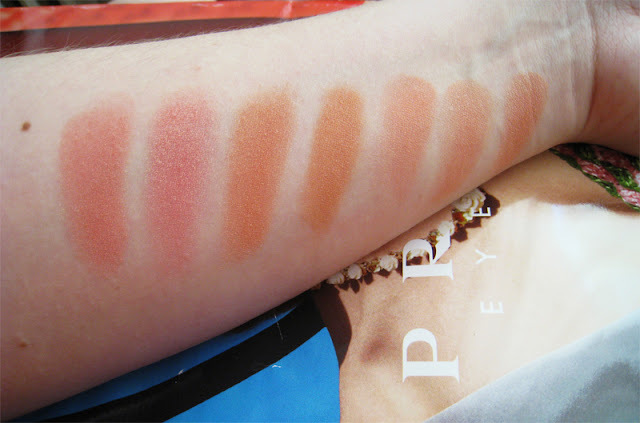 Do you like peachy blushes, especially at summertime? What are some of your HGs? Let me know! I wear mostly peachy blushes too, cause I have a warm toned complexion and I think that they suit me better than the pinky ones. Yes, I've had hard times in the past trying to find a cool pink, even if it's only for wintertime, they don't look good on me at all! Springsheen is very pretty, I think I might visit my local Mac and take advantage of the 25% off! Yes very pretty! And awww this 25% off, it always tempts me! So many pretty colours, it's very difficult to choose only one! I like Springsheen for a pinkish coral and the Essence one for a more orangy one! The Essence is such a good choice because it's very cheap! M.A.C. και Shu Uemura απίθανα!Απο τιs αγαπημένεs μου αποχρώσειs έχειs βάλει! :-) Τα ροδακινι τα αγαπω παντου, μεχρι κ στα ρουχα! τα peachy χρωματα ειναι τα καλυτερα!! mou aresei para poly to blog sou! ama theleis perna mia bolta kai apo to blog mou! Yes it's a quite good dupe for the Shu Uemura, it's hard to find peachy blushes at drugstore brands but this one is just perfect!